But like other demons, Satan could change his image for only up to 6 hours, i.e., midnight till dawn. Ordinary demons live in the trees, Satan lives is Vatican where the dead is preserved. He also goes for holidays in Mecca during Ramadan and have fellowship with big-nosed and stinky Saudi Arabs and other Muslims. Satan is half Italian and half Arab. He likes Hindu Indians and Chinese Buddhists though. 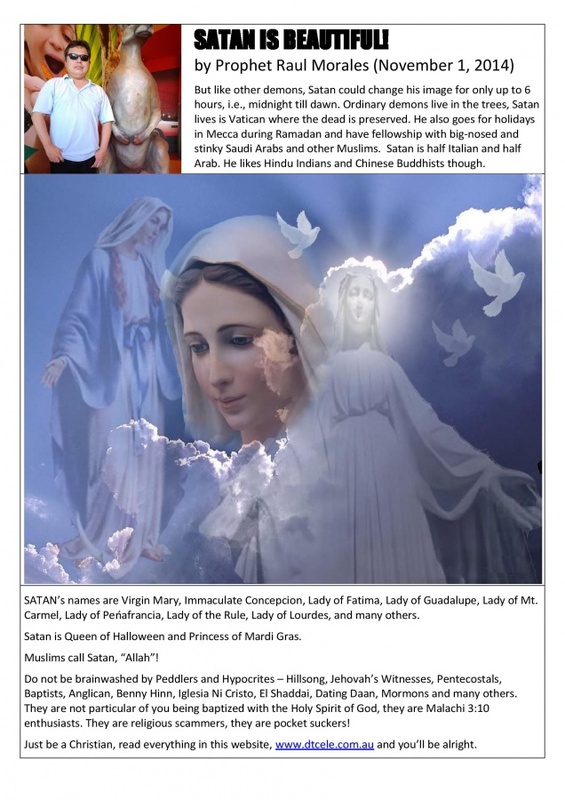 SATAN's names are Virgin Mary, Immaculate Concepcion, Lady of Fatima, Lady of Guadalupe, Lady of Mt. Carmel, Lady of Peńafrancia, Lady of the Rule, Lady of Lourdes, and many others. Satan is Queen of Halloween and Princess of Mardi Gras. Do not be brainwashed by Peddlers and Hypocrites - Hillsong, Jehovah's Witnesses, Pentecostals, Baptists, Anglican, Benny Hinn, Iglesia Ni Cristo, El Shaddai, Dating Daan, Mormons and many others. They are not particular of you being baptized with the Holy Spirit of God, they are Malachi 3:10 enthusiasts. They are religious scammers, they are pocket suckers! Just be a Christian, read everything on this website, www.dtcele.com.au and you'll be alright.